If pop art were to cross paths with prefab housing, the result would likely look this Warhol-worthy prefab home. 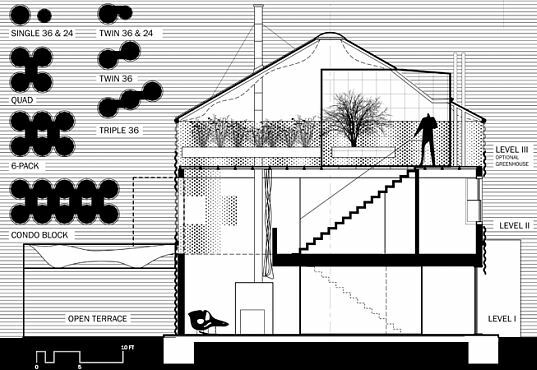 Designed by Austin + Mergold, A-House-In-A-Can is a single-family residence built in the round interior of a grain silo. 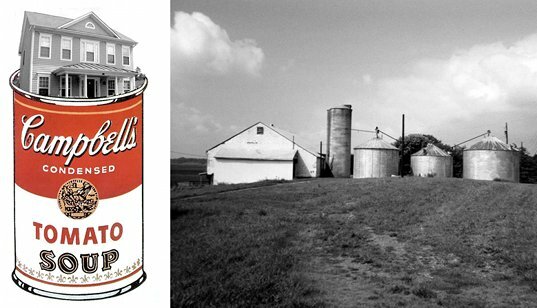 Constructed with off-the-shelf components and clad with a prefabricated steel facade, this innovative prefab home design could be the perfect solution for your Warhol-loving, farm-living dreams. Grain silos aren’t difficult to source from farm supply companies and they are fairly sturdy, designed to withstand wind and rain while keeping the grain inside dry. Made from 14 GA galvanized corrugated steel (a little over 1/16″ thick), a grain silo could serve as a beefy, industrial looking exterior for a home. Similar in concept to using a shipping container as the shell for a project, grain silo fabrication is easily and cheaply accomplished. The House-In-A-Can home design utilizes a 36-foot diameter grain silo and features with three levels totaling 2,000 square feet of living space. Two or three bedrooms can be located on the second level, with the living and dining space on the bottom. The top floor can be used as a deck, extended living space, or even a greenhouse. Also, multiple silos could be connected to each other to create larger homes or apartment blocks. And if you buy 5, Austin + Mergold will happily give you the 6th for free! Interesting… this is the second time I have come across this product recently. The first was a few months ago when one of our customers in Washington purchased a smaller sized grain silo for their Dining room. We are supplying the prefab house package up to and including the attachment to the Silo as well as furring material on the interior. Definitely an interesting product and quite cost effective if you are looking for a circular building/room. Buckminster Fuller's Dymaxion House which was originally built in KS, but is now in the Henry Ford Museum, was inspired by grain silos.